Most people are familiar with the phrase “what goes up, must come down.” It’s a simplification of Issac Newton’s observations that led to the Law of Gravity. In the stock market, we see this happen quite often, although in the opposite direction. In other words, what goes down, should come back up. Experienced investors will be quick to point out the error of that logic. They’ve seen stocks fall, purchased them at low prices, and then watched prices fall even further or even go bankrupt. A small bump in price after a fall can be a false signal, affectionately called a ‘dead cat bounce.’ But in many cases, a company that falls could be the key to outsized gains in the long run. 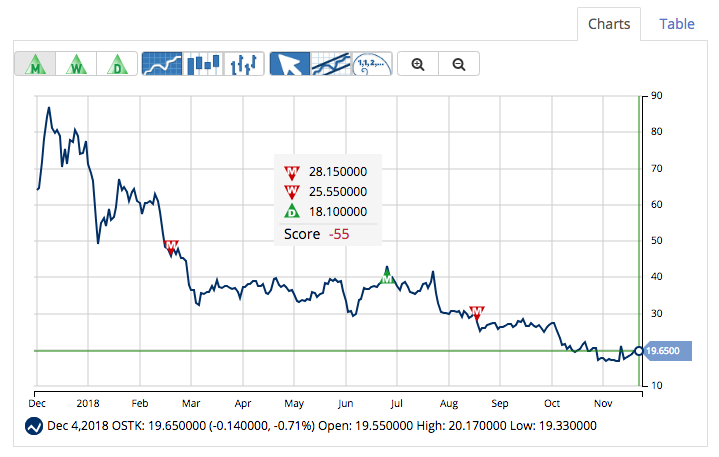 For this week’s stock pick, a low stock price isn’t indicative of a deeper issue. For value investors, it’s a buying opportunity. Overstock.com (OSTK) is a $615 million niche retail company that specializes in catalog, mail order, and online services. As one of the few “online tech boom” start-up companies that came out around 2000, Overstock.com has established itself as a go-to retailer for discount household products. The company has a bad string of earnings results with the latest being a miss of nearly twice what analysts expected. It reported a loss of $1.58 per share compared to the loss of $0.80 that analysts had originally estimated. At first glance, it might seem like investors should avoid Overstock.com like the plague – but there’s a bigger story here. The company was known for being among the first to adopt block-chain technology and accept Bitcoin as payment. Considering the crash in Bitcoin investments earlier this year, it’s no surprise that companies like Overstock.com fell far short in their earnings results. Still, as block-chain technology evolves, the company may be in a good position with already-establish infrastructure. One additional catalyst for the company is the upcoming holiday season. As volatility returns, consumers may start looking for ways to save giving Overstock.com a larger share of the holiday season this year. But How Are the Numbers? The stock currently has negative earnings making P/E valuation impossible. But sales are trending up, and a price-to-sales ratio of just 0.34 tells investors that the stock price and sales revenue don’t match. The company also carries no long-term debt obligations and only has $262 million in total liabilities while cash holdings total more than $200 million. That gives Overstock.com plenty of space to absorb a poor 2018 performance and immediately look to the future. There’s another story to the numbers – the massive 48% short float. That level of negative selling pressure is unsustainable especially after considering that the stock is down more than 69% year-to-date. 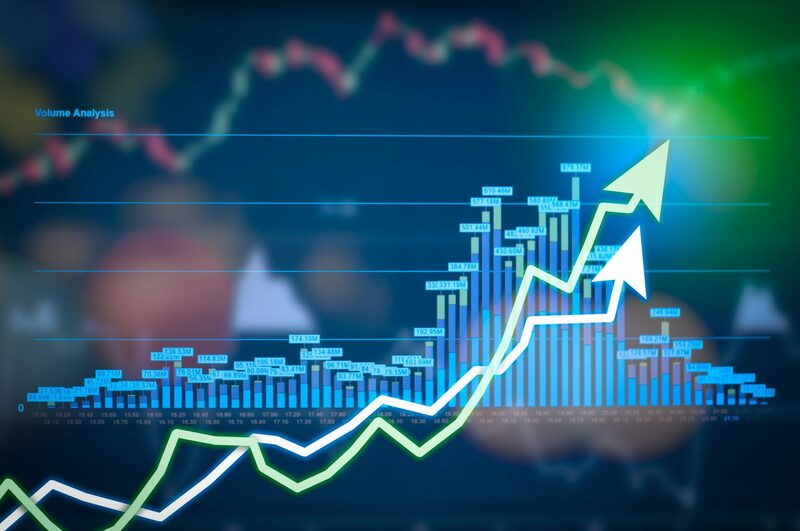 If the stock begins to rise, a short squeeze could develop as sellers buy back shares to cover their positions. Based on the expected EPS trend going forward, Overstock.com should be fairly valued at around $30 per share – a gain of about 50% from its current price. Investors may hesitate to jump on a stock that’s fallen so much and has a heavy amount of short selling activity, but at these prices, Overstock.com looks far too cheap for the wrong reasons to stay there. MarketClub’s technology is detecting that a counter-trend rally is underway. It also indicates that the current downtrend could be changing and that OSTK may be moving into a trading range, putting members into a sidelines mode. While the Daily Trade Triangle was issued on November 23rd, MarketClub members are still waiting for a new Weekly or Monthly Trade Triangle to confirm this new upward trend. Members will be the first to know when this trend makes a shift. 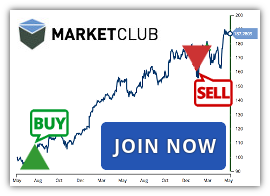 Join MarketClub now with a 30-day trial to get the next signal for OSTK!